Editing a purchased design with FTCU can be a challenge. 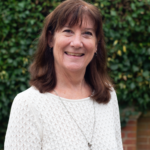 There are several things that you should know that will help you to understand why there are limitations of what you can edit with your purchased design. First, let me explain a little technical information. When you purchase a design, it will be in a file format that can be “read” by your brand of sewing machine. These file formats are: JEF, ART, DST, PES, VIP, VP3, SHV, SEW, PCS. Those are the most common and there are others. The brand of embroidery machine that you use determines the kind of file format that you will need. When you are digitizing a design with Floriani FTCU software and you save your work, you will save it as a WAF file format. This is called a “working” file. All digitizing software’s have their own unique file format. After you digitize a design, and you are ready to embroider the design, you will then need to save that WAF file to another file format that your machine can read. This format would be one of the above mentioned: JEF, ART, DST, PES, VIP, VP3, SHV, SEW, PCS. Your embroidery machine cannot “read” the WAF file. It can only read the format (or formats) that are specific to your brand. The WAF file format is actually made up of artwork lines. These are the lines that you are tracing as you digitize a design in FTCU. When you save the design to your embroidery file format then FTCU is converting those artwork lines into STITCHES. These are then called “stitch” files. stitch files – JEF, ART, DST, PES, VIP, VP3, SHV, SEW, PCS. 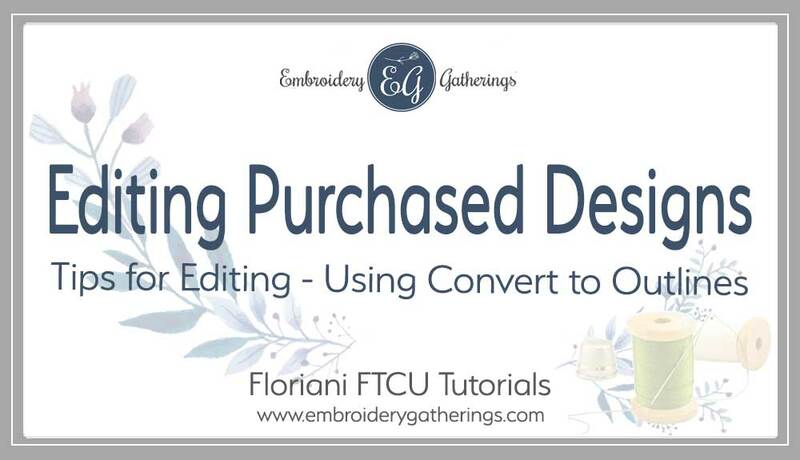 When you open a purchased design in FTCU, you will be opening a file that is not a “working” file. The artwork digitizing information that was contained in the original working file (that the digitizer used) is not retained in the stitch files. These files only contain “stitch” information and tell the embroidery machine what kind of stitch and what color to embroider. And that is the information that FTCU will display in the sequence view. The sequence view shows every thread color as “stitches”. 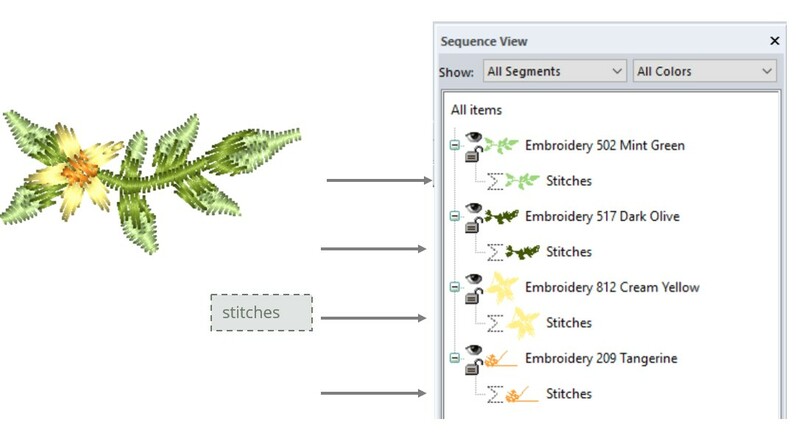 You cannot isolate one leaf, you can only view the whole thread color as one group of stitches. What if I want to delete the leaf on the end? How can I do that if the stitches are all grouped together? Logic would tell you to draw a circle around it (like I did) and then just delete it. Floriani FTCU has TWO lasso tools. One that I can never seem to figure out and the other that works but is hidden and no one even seems to know to use it. The hidden lasso tool is the one that I recommend using. Selecting the segment of the design that you want to edit or delete only works this way, if you can lasso the segment. Sometimes, the area that you want to delete is contained within another segment. Obviously, that makes it more difficult to select. If you want to edit part of the purchased design that is more complicated, it will be helpful to use the Convert to Outlines feature that is in FTCU. 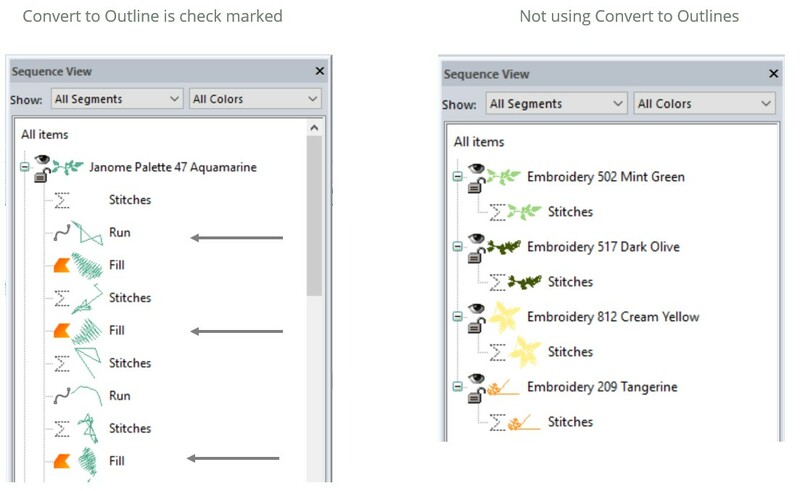 When you open a purchased design and the “the convert to outlines” box is check marked, FTCU will try to recreate the artwork outlines and convert it as best as it can to a “working file”. It is a good practice to ALWAYS make sure this Convert to Outlines is check-marked when opening a purchased design. It will give you more editing capability than just a stitch file does. 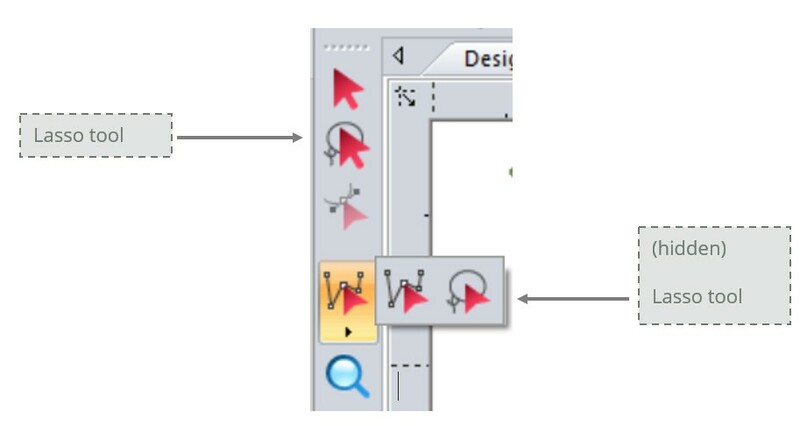 Here is how to open a purchased design and select the Convert to Outlines option. Here’s a Sequence View example of using the Convert to Outlines and not using it to open a purchased design. Notice that it shows stitch types RUN and FILL. These are the “outlines” that you can edit. The “stitches” are exactly that…just stitches. And most of the time, these are either the underlayment or a tie off. Now, you can have more editing capability because the software converted the stitches into outlines that you can edit. Unfortunately, it does not convert every segment. As you can see, there are still “stitches” and unfortunately, those are still very challenging to edit. You cannot break apart those stitches and edit them. You can only edit them either as a group of stitches or use the STITCH EDIT tool and isolate one stitch point at a time to move or delete. I hope that this gives you a better understanding of why it can be so challenging to edit a specific area of a purchased design. In FTCU, you can easily edit the size of the design or change the thread colors, but editing individual components is not always easy. That is why learning to digitize a design can be so important. Honestly, most of the time, when I want to edit a purchased design, I re-trace the area of the design, just so I can edit it the way I want it to be. It actually takes less time to re-digitize it, then it does to try to find a way to make the edits. Make a copy of the purchased design, to preserve the original, then retrace the area over top of the design and add the edits that you want to change as you are digitizing. Then, you can delete the original design. 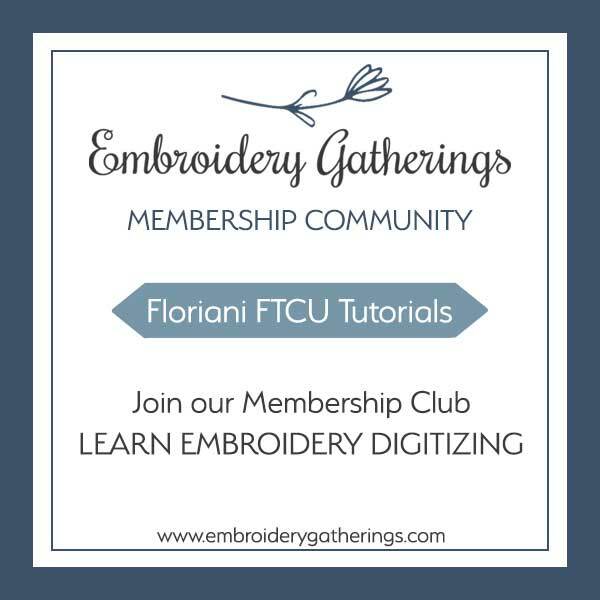 There are practice lessons in the Embroidery Gatherings Membership Club that will give additional information on how to edit purchased designs. Click here for more information about joining the Membership. Thank you sooooo much for this! I recently purchased a design and when I opened it in my FTCU program some of the stitches was missing. I thought it was the digitizer that missed some but he showed me the design was complete so I thought must be the program I have. So I was going nuts trying to fix this since I don’t digitize myself, its time consuming and I am a one women business with a lot of orders. So I searched online and took a look at your blog and read everything and when you mentioned “the convert to outlines” box, I was like….hm maybe its that. So I took the chance and unchecked mark it and BAM! it worked like a charm! My FTCU always automatically check marks “the convert to outlines” box for me so I unchecked it and it worked!!! So happpy!!!!! There is no missing stitches! Its complete! Thank you so much for this! You are a life saver! I was starting to wonder if I needed to get Wilcom but I love FTCU so I was determined to find a solution! For anyone struggling like I was, read my comment! So glad this post helped you and explained what Convert to Outlines does. It is a critical setting (either checked or unchecked) depending on what your purpose is. Most people have just the opposite experience as you. They get frustrated because all these see is “stitches” and they want to edit a shape. Anyway, glad this help you to understand how it works. Stick with FTCU – it does everything you need! Hi Paula. This is good information! Is there a better machine format design file that edits easier and with fewer orphan stitches or leftovers? You know, when you look at the stitch sequence pane and see all those little squiggles and lines that are now part of what should stitch out as a contiguous fill? I noticed this with my other digitizing software as well, but never thought to ask if for instance, a DST file might convert more “cleanly” so not as much clean up needed to be done. Very good information, just wondering if you can convert to outlines after you have opened the design? Will it work just as good as doing it while opening the design? I have convert to outlines unchecked, because it takes so long to open, if I only want to change thread colors it is not necessary to use it to open a design, so if I want to makes changes in the design, I use the convert to outline tool after I import the design. Just to let you know you can convert to outlines even after you have opened the design! All you have to do is select all click on “preserve as stitches” and the click on “ invert to outlines” and you are off and running,without taking all the time to close out and reopen. Great tip! Thank you, Winona!